The Bulldogs and Express both began the game with good energy, with the Bulldogs having the best early chance on a Jackson Doucet net drive, followed by the Express earning a couple of chances on the rush. John Hawthorne and Kolby Matthews were solid in the respective nets to keep it scoreless through the middle of the period. The Bulldogs were penalized on a Mackenzie Wight hit, and the Express threatened but Hawthorne was solid when required to keep it tied. The Bulldogs then took the lead on the rush as Keaton Mastrodonato intercepted an Express pass in the Bulldog zone and immediately attacked with speed on the rush. Mastrodonato would outlet to Jackson Doucet who carried it wide up the left side into the Express zone, before putting a perfect cross-crease pass onto the tape of Mastrodonato who deflty one-touch deflected it high over Matthews to make it 1-0 at 10:37 of the first. The score stayed that way with Hawthorne again making a handful of good saves to protect the lead, until the final seconds of the period when Jackson Doucet tapped a loose puck below the goal line to Keaton Mastrodonato, who made a perfect pass to the deep slot for Grayson Valente, who made no mistake with a quick release high far side over the glove of Matthews to make it 2-0 Bulldogs at 19:43 of the first. Shots after 20 minutes were 14-8 Express. The Bulldogs built their lead early in the second on the power play, as they made at least three good plays to win races on loose pucks to keep the zone alive. Jackson Doucet would make a pass from the top of the left circle down low at the side of the net for Keaton Mastrodonato, who put a perfect cross-ice feed through the slot for Aaron Bohlinger, who one-timed it home short side before Matthews could recover to make it 3-0 at 1:33 of the second. The big lead might have been the worst thing that could've happened for the Bulldogs, or the best thing that could've happened to the Express, as they spend the next handful of minutes carrying the play and generating chances in the Bulldog zone. They would cash in on the rush to get on the board as Danny Pearson beat his man to the net and deflected a pass to the top of the crease from Joshua Wildauer up and over Hawthorne to make it 3-1, with Henry Rybinski also drawing an assist at 5:11 of the second. The Express continued to push, with Hawthorne being solid on a couple of great chances. Matthews was solid at the other end when the Bulldogs generated chances on the rush catching the Express pushing. Matthews came up with a big save on a short-handed breakaway chance by Dawson Tritt to keep it a two-goal game with Ryan Miotto in the box for body checking. The Express scored at the other end less than a minute later when Regan Kimens found the five-hole on a rolling puck to make it 3-2, with assists to Christian Sanda and Henry Rybinski at 15:10 of the second. Shots in the period were 17-14 Express, for a 31-22 advantage in their favour after 40 minutes. The third period saw the Express continue to have the edge in the play, with Hawthorne being busy but razor sharp to protect the lead to the midway point of the period. The Express would be awarded a power play opportunity that changed the game a minute later though, as it was 3-3 on a quick set up just 13 seconds into the power play that saw Henry Rybinski set up Dallas Farrell in the left corner. He made a perfect cross-crease feed to Regan Kimens at the backdoor, where he made no mistake in one-timing it up and over Hawthorne at 11:00 of the third. The Express would continue to push earning a power play a couple minutes later, but Hawthorne kept it tied into the dying minutes. The Bulldogs also had their chances for the go-ahead goal, with Mitchel Deelstra hitting the crossbar and being unable to convert a breakaway with the puck bouncing on him in the slot. Dawson Tritt would also have a great chance on the doorstep, but Matthews got his left toe on it to keep it tied. 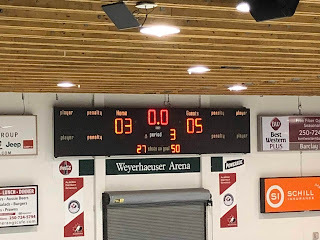 The Bulldogs would then surrender a backbreaking goal that stood up as the winner with just over a minute to play, as a Bulldog defender misplayed a puck in his feet that the Express found in the right corner. All three Bulldog forwards were already gone out of the defensive zone, as Regan Kimens walked to the net and slid it home through the legs of Hawthorne to complete the natural hat trick to make it 4-3 at 18:52 of the third, with Connor Gregga drawing the lone assist. The Bulldogs would earn an attacking zone faceoff with 58 seconds remaining and took their time out and pulled Hawthorne but lost the ensuing draw and the following battle for the puck and couldn't generate a chance before the Express sealed the deal into the empty net as Joshua Wildauer was found alone over the Bulldog line by Danny Pearson to make it a 5-3 final at 19:37 of the third to complete the scoring. 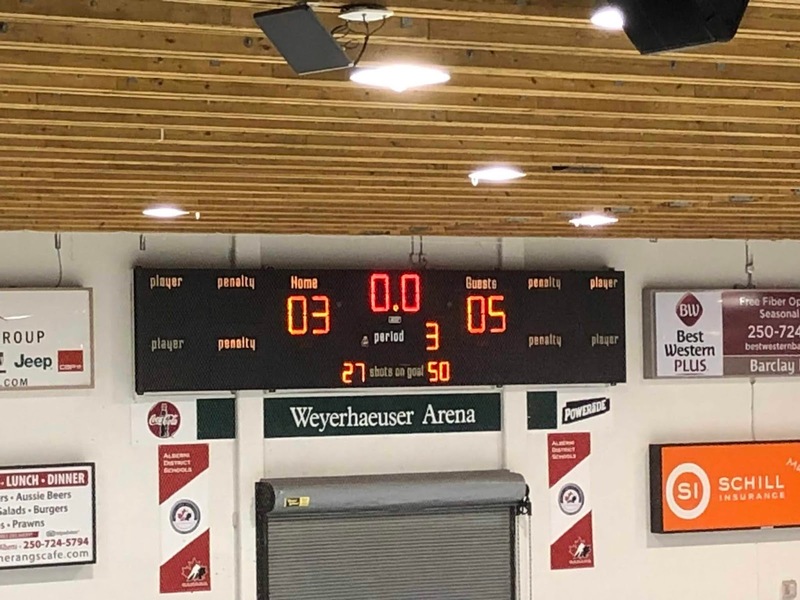 Shots in the third were 19-5 Coquitlam, for a game total of 50-27 with Kolby Matthews earning the win while John Hawthorne earned third star honours while taking the loss. The Bulldogs went 1 for 1 on the power play, while the Express went 2 for 5.